This was my third visit to Don Jose, lunch with my friend Tim Foster from Montclair. Tim turned me on Don Jose. We both love the place and think it is the best Mexican in the area. In the summer we love Sangria, white and red. The blood-red color of this beverage inspired its name, which is derived from the Spanish word for "blood." 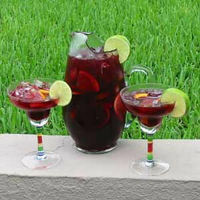 Sangria Rojo is made with red wine, fruit juices, soda water, fruit and sometimes liqueurs, brandy or cognac. Sangria Blanco (white sangria) is made with white wine. Both are served cold over ice and make a refreshing cooler on a hot summer day. Here are some recipes for Sangria and links to great summer cocktails recipes. Had the good fortune to attend a spectacular tasting of some of the very best Bordeaux wines of the 2003 vintage. Presented by Gary Fish, and his staff of Gary's Wines. Here are the wines that I will be buying. 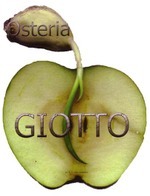 Enjoyed a great business dinner at Osteria Giotto. I have the opportunity to dine here about once a year and always wonder why we don't go more often. The food is concistently excellent. With their recent expansion and comfortable street side dinning on quiet Midland Avenue it is easier to get a table, but be sure to call ahead as they are usually packed. I find myself buying more and more wine with screw caps. In fact I prefer them for a number of reasons. But, when I share this opinion, most of my friends look at me in disbelief. While we love NJ's liquor laws for all the BYOB restaurants we have, but we sometimes enjoy sitting at a bar to have a lite dinner and a glass of wine, unfortunately because of the restricted number of retail licenses that NJ issues such places can be few and far between. The NJ laws are actually interesting reading, ABC Handbook, covering everything from automatic dispensers, through happy hour, to wine doggy bags. I'm serious. In Montclair we have Diva Lounge which has a few wines by the glass, adequate bar food and a awesome list of cocktails. However, it is not exactly the type of place I have in mind. To find others we have been venturing outside of Montclair. Here's what we have found so far.